Facebook is rolling out a new feature within its mobile app that will help you find the nearest public Wi-Fi networks anywhere in the world. Originally spotted last November as part of a limited test, the feature is now launching for everyone under the Find WiFi section within the ‘More’ tab. You might be prompted to turn it on first since it’s not on by default. Once that’s done you will be able to see a list of the closest public Wi-Fi hotspots or browse them on a map, then after clicking on one of them you’ll see more information on the businesses hosting it, like open hours, what kind of place it is (restaurant, library, etc. ), and the name of their network. Find WiFi could be useful for people in emerging markets where mobile data is slow or expensive, as well as people who don’t want to incur heavy roaming charges when traveling internationally, and otherwise pretty much anyone that doesn’t want to eat up their data allowance while using data intensive features like broadcasting through Facebook Live. This isn’t the first time Facebook tries to facilitate Wi-Fi access. Two years ago, the company partnered with Cisco in a pilot program that offered free internet access in participating businesses in exchange for a check in. It also launched the controversial 'Free Basics' service, which offered free but limited internet access to people who don’t have it. In this case Facebook isn’t providing Wi-Fi hotspots itself, nor it is compiling its own map of businesses offering them. 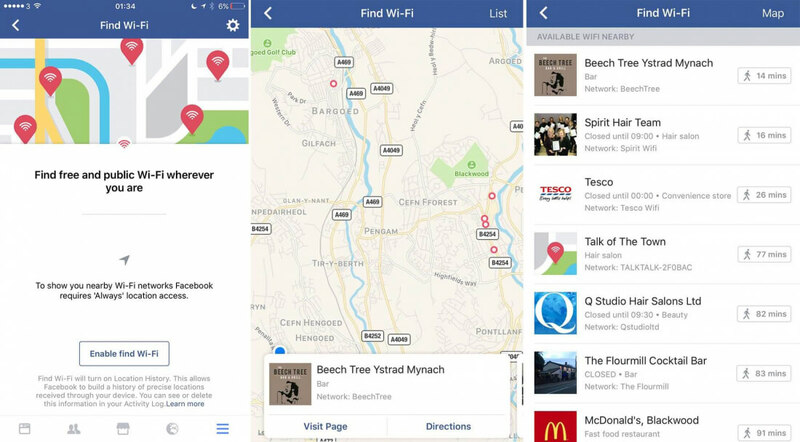 Instead it's simply letting businesses register their hotspots, so they appear under the new Find WiFi menu in the Facebook mobile app. The new feature is beginning to roll out on iPhone and Android. Keep in mind that enabling Find WiFi also turns on Facebook's Location History feature which the social network uses to gather data it can then use to sell targeted ads.